Effective March 2016 the City of Houston NO LONGER accepts glass in the Green Curbside Recycling Program. You may still recycle glass at all drop-off locations. Imagine a water bottle that dreams of becoming a pair of jeans, a steel can that hopes to someday be transformed into a bicycle, or a plastic bottle that believes that, one day,it could become a park bench.These are some of the many destinies that could be fulfilled if more Americans took time to do one thing: recycle. A new public service advertising (PSA) campaignintroduced by Keep Houston Beautiful, the Ad Council and Keep America Beautiful (KAB) aims to inspire the nearly two in three Americans who do not recycle regularly to make recycling a part of their daily lives. Despite increased visibility of public recycling receptacles and increased curbside programs, levels of recycling remain low at less than 35 percent. The average American generates 4.4 pounds of trash per day and recycles or composts only 1.53 pounds. Think of all the jeans, bicycles and park benches that could be produced if all of that was recycled instead. As a whole, the United States produces approximately 250 million tons of trash each year and recycles and composts just over 87 million tons of this material, according to the U.S.EPA. The Ad Council first partnered with KAB to address the issue of littering more than four decades ago. The result was Iron Eyes Cody—“The Crying Indian,” — one of the most iconic advertising campaigns in American history. Our new PSAs have a different goal, but one that is just as important: to waste less by recycling more. Our “trash” could go on to live whole new life and serve a valuable purpose, if only more people would give it a chance. Visit IWantToBeRecycled.org to get a behind-the-scenes look at how trash can be transformed through recycling, to debunk common recycling myths, and to find details about recycling locations near you. Recycling is reusing the material in something to make something else. Recycling is a way of turning old stuff into new stuff, of changing used household materials we throw away into new products we buy and use. Lots of things we consider trash can be reprocessed into new products and used again: plastic bottles, newspapers, soft drink cans, jelly jars and many more. Recycling is collecting, reprocessing, marketing and using these materials. Making new plastic containers from old plastic bottles is a good example of recycling. Plastic containers can also be turned into stuffing for pillows, or made into car dashboards. Recycling turns discarded items into products - again and again and again. The City of Houston encourages recycling. The City of Houston wants Houstonians of all ages to recycle. Houston encourages recycling because it helps clean up the environment and saves energy and valuable natural resources. To slow down the rate at which we use landfills; to conserve natural resources; and to reduce manufacturing pollutants and save energy. When we throw things into the trash, we add to the amount of material going into landfills. By recycling items, we keep these materials out of landfills. The more trash we can keep out of the nation's landfills, the longer we can make them last. Recycling is important as a way to save energy, too. For example, recycling aluminum takes only 5% of the energy needed to make aluminum from raw materials. Recycling an aluminum can saves enough electricity to operate a TV for three hours. Most people agree that conserving natural resources, energy, and our land is the right thing to do - and recycling saves all of these! Each year Texans create enough waste to fill two lanes of I-10 from Beaumont to El Paso ten feet high. When you throw out your trash, do you ever stop to think who will take care of it or where it goes? Since we don't see piles of paper, glass, cans or plastic outside our front doors, most of us never have to worry about how to get rid of it. Yet we create much more trash than our country can easily handle. Every day Americans throw out enough trash to fill 63,000 garbage trucks. On average, each Houstonians produces 6.2 pounds of solid waste each day. This adds up to more than a ton of trash per person, per year. The Houston-Galveston Area Council has a regional goal to reduce the per capita amount of solid waste by 80% by the year 2012. Most of the trash gets hauled away to landfills where it's buried. To build a landfill, a huge hole is dug and then lined with clay or huge sheets of plastic. When a landfill is full of trash, layers of soil and clay seal it inside. Although American landfill capacity is greater than it was a few years ago, it has become harder to find places to build new landfills. Nobody likes the idea of a landfill in their neighborhood. As a result, places where we can dispose of our trash are dwindling. The average person throws away 4 pounds of garbage PER DAY. Another way to dispose of trash is to burn it. This disposal method is called incineration or combustion. We can produce energy by burning waste. When we reclaim energy through the disposal process it's called resource recovery. By recycling 1 plastic bottle not only saves anywhere from 100 to 1000 years in the landfill but also saves the environment from the emissions in producing new bottles as well as the oil used to produce that bottle. How do you prepare items for recycling? Sort materials, rinse containers, and store in a safe, dry place. It's easy. With a little practice, it takes less than five minutes a day. Sort your materials and rinse any leftover contents from containers so your items won't begin to smell bad or attract ants and bees. Here is how the City of Houston wants you to sort materials and get them ready to recycle. Newspapers: place in paper bags, stack and store. Cans: empty, rinse and store. Plastic containers: empty, rinse, flatten and store. Glass containers: empty and rinse. Separate by color - clear, brown, and green. Store unbroken. Motor oil: drain and store in a sealed container. The City collects all the recyclable materials we've talked about - and many more. The City of Houston provides bi-weekly curbside recyclables collection to 100,000 single-family homes. Curbside recycling requires residents to place newspaper, magazines, telephone books, aluminum and tin cans, advertising mail, corrugated cardboard, plastic soft drink, milk and water containers, together in the same bin. Each bin holds 18 gallons of recycling material and is itself made out of 25% recycled plastic and 75% virgin material. Used oil is also collected and is placed next to the bin in clean containers with screw-on tops. The City now accepts plastics 1 - 5, and 7. Under Automated Recycling Program, curbside recycling service will be collected using automated collection vehicles. Each of the approximately 105,000 homes participating in the program received a 96-gallon green cart similar to the black garbage can. Participants will be able to put all of their unsorted recyclables into one city-provided container. Items that can go in the cart include: newspaper, magazines, catalogs, phone books, cardboard (flattened), plastics 1-5 and 7 (rinsed and drained), aluminum tin cans (rinsed and drained) and glass bottles and jars (rinsed and drained). Recyclebank rewards participants for their recycling efforts by offering valuable Recyclebank points that can be redeemed at local & national stores. To learn more visit RecycleBank. The City of Houston collects Tree/Junk Waste once a month, on alternate months, designated collection day by neighborhood. As part of its "heavy trash" collection, Residential Tree Waste is collected in odd months, such as January, March, May, July, September and November. "Tree Waste" is defined as clean wood waste such as tree limbs, branches and stumps (lumber, furniture and treated wood will NOT be accepted). 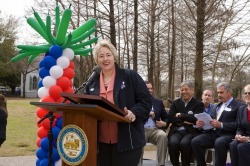 The tree waste is then hauled to a facility where it begins the process of becoming reusable City of Houston Mulch and is available in local grocery and home improvement stores. "Junk Waste" is defined as items like furniture, appliances and other bulky material. Junk Waste is collected in even months, February, April, June, August, October and December. Junk Waste may not be placed for collection during a Tree Waste Month. Please Note: Tree Waste is accepted during Junk Waste Months. However, to ensure that your Tree Waste is recycled, you may hold tree waste materials until the next Tree Waste designated month or bring it to a Neighborhood Depository/Recycling Center. The City encourages citizens to reuse grass clippings as composting or mulching material. Grass clippings, small branches, and leaves must not be placed in the automated garbage cans. They must be put in compostable bags, not weighing more than 50 pounds, and placed at the curb 3 feet away from the automated container for separate yard trimming collection. Small branches may be put in bundles as long as each bundle is less than 4 feet in length, 18 inches in diameter, and not weighing more than 50 pounds. Yard trimmings mixed with paper, plastic or any other type of waste will not be collected. The City of Houston Building Materials Reuse Warehouse (Reuse Warehouse) accepts donated construction materials from builders, supply companies, remodelers, contractors, and individuals. These materials are made available at no charge for use by any non-profit organization. The Warehouse benefits the community by providing storage space for excess building material that would otherwise be dumped in local landfills. The City of Houston stores the material until it can be used by local organizations. Learn more about ReUse Warehouse. The city operates six neighborhood depository/recycling center sites to help you properly dispose of heavy trash. Tree waste and other recyclables are recycled at these locations too. These neighborhood depositories have some restrictions on what they will take. The North and South ESC locations both provide a drive-through, drop-off site for Houston residents to bring their Household Hazardous Waste (HHW) and residential electronic scrap items. These facilities accept antifreeze, batteries, fuel oil, paint, and paint thinner for recycling at designated sites. Styrofoam blocks (plastic #6) are now accepted at the ESC South (only). Every Friday from 9 A.M. - 12 P.M., household chemicals and paint that were brought to the ESC for disposal but appears to be in good condition is made available for citizen reuse at no charge. You will be required to sign a liability waiver before removing materials from the site. there is a limit of six (6) chemical items and 1 cartload of paint per week. This service is only available at the ESC South location. Hours of Operation: Tuesday & Wednesday, 9 A.M. - 3 P.M.; the 2nd Saturday of each month, 9 A.M. - 3 P.M. Hours of Operation: Every 2nd Thursday of the month, 9 A.M. - 3 P.M.
City recycling trucks are equipped to collect used motor oil. You may also take your used oil to the Westpark Recycling Center and area Neighborhood Depository/Recycling Centers. The City has several area drive-thru recycling facilities: The Westpark Recycling Center and all six Neighborhood Depository/Recycling Centers have vehicle access where household recyclables can be dropped. NOTE: Styrofoam blocks (plastic #6) are now accepted at the Westpark Recycling Center. Each year the City offers a Christmas tree recycling service. The mulch from the chopped-up trees is used in City landscaping projects. Tree donors receive a free tree seedling. The City has an office paper recycling program for City employees. Types of paper collected include newspaper, computer paper and white ledger paper. For the City of Houston's tips on composting click here. Step One: Collected paper is sorted and taken to a mill where it is shredded and mixed with water. Step Two: The ink is removed from the paper paste. Step Three: The paper is then pressed and dried by giant metal rollers. The paper collected by the City of Houston is delivered to a processing center. At the processing center, the paper is carefully sorted into the different types used by paper mills. Paper is shipped to a mill where it's brought to the pulper. Here warm water and chemicals break the paper into pulp. This pulp is called slurry. Since pulp starts out as 99% water and 1% fiber, slurry looks like a thick milkshake. Next, ink is removed from the pulp. After all of the ink has been removed, the pulp is bleached and mixed with traditional pulp from trees. The pulp is now ready to be made into various types of paper. The mixed pulp is pumped between two moving wire screens. The water is removed from the top and bottom, and the fibers form a mat. The mat is sent through pressing and drying rollers to remove more moisture. It's then ironed for smoothness, and the paper is packed in cartons or rolls. 45% of the paper Americans use is diverted from landfills and recycled by this process. Step One: Collected glass is sorted and taken to a processing center where it is crushed into very small pieces. Step Two: The crushed glass is mixed with other things, heated and molded into new shapes. Step Three: If bottles are being made, the finished bottles are then taken to factories where they will be filled again. Glass containers collected by the City are recovered, color-sorted, and made ready for recycling. Once the containers have been sorted into clear, green and brown glass, recycling centers crush the color-separated glass containers into cullet, or small pieces of recycled glass. The cullet is loaded onto trucks or railroad cars. Then its shipped to a processing company where its cleaned and made ready to be sold to a glass factory. At the glass factory, the cullet is mixed with sand and other substances and heated. The molten recycled glass is then molded into the shapes of bottles and jars. The new glass is just as strong as glass made without cullet. Glass never wears out, and glass containers can be recycled forever without loss of quality. Glass recycling works so well that most bottles and jars contain at least 25% recycled glass. Recycling glass saves more than a quarter of the energy used to make glass from raw materials. Step One: Collected plastics are sorted into generic resin types. Step Two: the plastics are baled for shipment to a processing plant. Step Three: At the processing plant, the plastics are either shredded or made into pellets. Step Four: The plastics are then ready to be made into a variety of new products. Plastics from the City collection program are sorted to increase their value and compacted to reduce shipping costs. Sorted plastics are chopped, washed, and converted into flakes or pellets that are then processed into new products. The City requires the use of recycled plastic in automated garbage carts and curbside recycling bins. Step One: Cans arrive for processing at a recycling plant. Step Two: Shredded cans are melted in a special furnace. Step Three: Each Ingot of recycled aluminum produces more than one million new cans. Steel cans are separated from aluminum ones by magnet. Then the cans go into a shredder. The cans are shredded so they take up less space when they go to the smelter to be melted and used again. Aluminum is a good example of how recycling can reduce pollution. Making new cans from recycled aluminum cuts air pollution like sulfur dioxides by 95%. For 21 years, the City of Houston has collected over 205 million pounds of recyclables. But we can do better. So now that we've described how the City and manufacturers are helping to recycle, let's talk about how you can help reduce trash. Reduce the amount of waste you produce by purchasing products with less packaging and buying only those things you really need. Reuse products and their packaging. Fix or repair things instead of throwing them away. Buy used items instead of new ones. And of course, recycle! Buy products with less packaging and buy the largest volume of containers you can. Buy concentrates and refill packages. Bring your own canvas or reusable bags to the grocery store. Maintain and repair items like clothing and appliances. Reuse bags, containers, and twist ties. Sell or donate secondhand items at fairs and garage sales instead of throwing them out. Use energy-efficient light bulbs and rechargeable batteries. Shop for items made with recyclable materials. Collecting items for recycling is only the first step. Manufacturers must make new products from the collected recyclables and you must buy products made from recycled content. Successful recycling is a loop. The recycling loop begins with you, when you and others in the community put materials out for recycling or drop them off at a drive-thru facility. The next step in the loop is when a manufacturer buys and uses the recyclables materials collected. The materials are made into new products and put back into the marketplace through retailers. The last step in the process involves you again when you are asked to purchase the products made from recycled materials. Then the cycle starts all over again. This can repeat forever. Recycling isn't the total answer to the solid waste problem. You can't reuse everything. You'll always have something to throw away. You'll still have to bury some trash in a landfill or burn it in an incinerator. But recycling can be cheaper than either burning trash or hauling it to landfills. The key is to remove as much as possible of the paper, glass, plastic, cans, and other reusable materials from our trash. If the amount of garbage can be reduced, it'll cost less to get rid of it. The City of Houston has set up several programs to recycle many different types of materials. But it's people, not programs that make recycling work. We have to change the way we've been throwing things out for years. When we persuade everybody to recycle, and we all work together, recycling becomes more effective. It's up to each of us to make the effort. So if you haven't been recycling, get started. And if you already recycle, keep saving things to reuse. Support anything that helps the environment and cuts down waste. Here is a case where everyday actions can have a direct and immediate impact on the world around us. The answer to our garbage problem begins in our homes and at our curbside. Recycling starts with you. Remember the City Customer Service Hotline number is 713-837-0311, or dial direct 311.